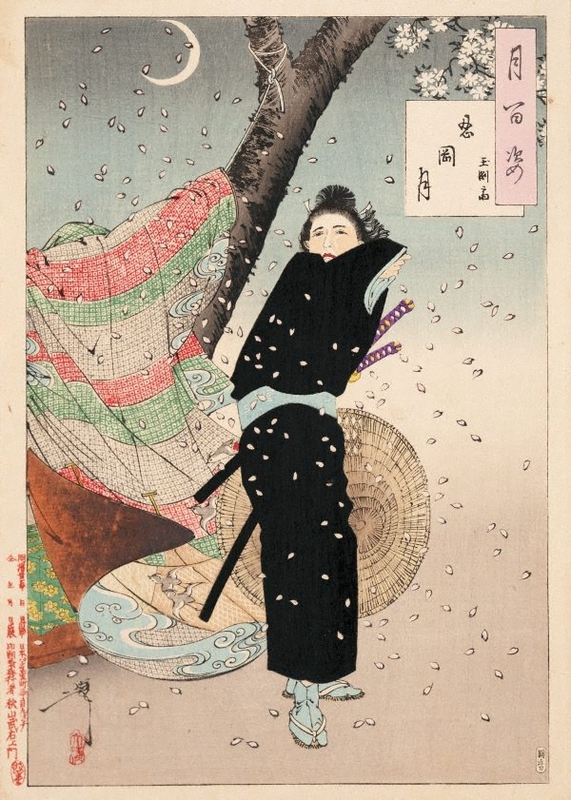 A young man dressed in an elegant black robe raises his sleeves as if to shield himself from the fallen cherry-blossom petals. The top-knot of his hair and the two swords at his side indicate his samurai status. The title cartouche identifies his name as Gyokuensai and the location for the scene as Shinobugaoka, a popular place for cherry-blossom-viewing parties in Edo. Behind Gyokuensai, a gorgeously decorated kimono is seen attached to a branch. In pre-modern times, clothing was used as a curtain or backdrop for picnics.